The next big California earthquake has concerned scientists and California residents for decades. Now, recent research points to the regular occurrence of "slow earthquakes" as increasing the risk of a magnitude 7 or greater earthquake. The San Andreas fault is one of the most closely watched and feared faults in the country due to its history of creating high powered earthquakes and proximity to millions of people. A recently published study in Nature Geoscience outlines how slow earthquakes influence the likelihood of higher magnitude earthquakes in California. 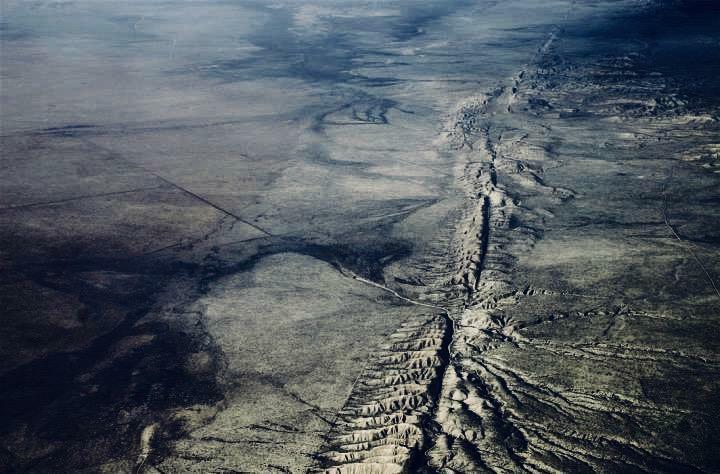 Geologists and geophysicists have known about the slow earthquakes occurring along the San Andreas fault, however, the recent study shines new light on how the fault moves during slow earthquakes. Previously, it was thought that slow earthquakes involve the slow and consistent movement of a fault like the San Andreas. The conclusion was that these smaller movements steadily released built up stress in a fault system and reduced the likelihood of a larger earthquake. However, the recent research finds that slow earthquakes involve not a slow and steady movement but sharp and sporadic movement along the fault (albeit at low magnitudes). Radar data showing ground movement along the San Andreas fault. 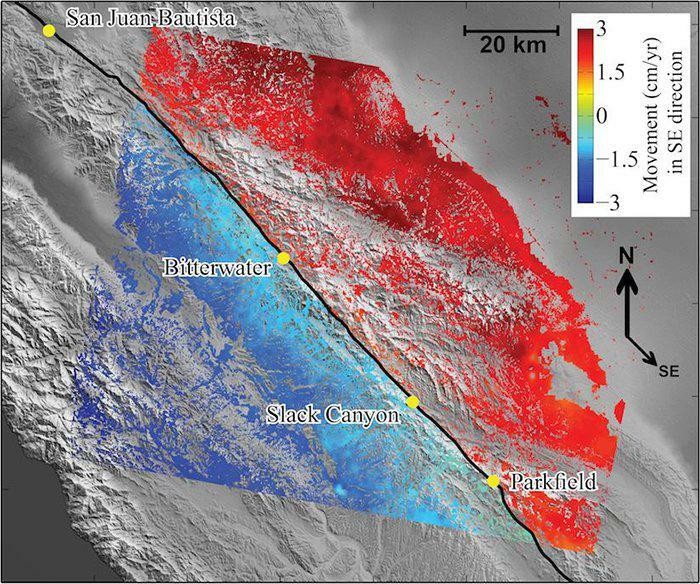 The research team used historical synthetic-aperture radar records from 2003 to 2010 to reconstruct three-dimensional images of the San Andreas fault. After piecing together the record, the research team found the movement along the San Andreas fault was more akin to a stick-slip periodic movement as opposed to the slow and steady motion. In all, the team found that movement along the fault varied from about 10 centimeters per year (4 inches) to zero. The key difference in these two types of slow earthquake movements along the San Andreas fault is their ability to either reduce or increase stress along the fault. Slow and steady movement is thought to dissipate stress, however, it does not appear the movement is actually slow and steady. Therefore, the periodic and jerky movement along the fault acts to compress "stuck" areas along the fault, increasing stress and the likelihood of a large earthquake. This new finding concerns scientists, especially as this is not currently included in earthquake forecasts for the San Andreas fault. The episodic slow earthquakes were found to increase stress along locked/stuck sections of the fault and increase the risk of the next big California earthquake. These findings, unfortunately, increase the likelihood of the next big quake. The lead author, Mostafa Khoshmanesh from Arizona State University expects there is a 75 percent chance a magnitude 7 or larger earthquake will hit both northern and southern California in the next 30 years. When the next one does hit, experts predict as many as 3.5 million homes will be at risk and damages could top $289 billion.